The primary function of heavy duty trailer suspensions is to link the trailer to its wheels. This provides a compliant connection which protects the trailer cargo from the shock and vibration inputs developed at the road surface. In addition, the suspension must meet the customers’ expectations for usable life, and do so while being economical to manufacture. One of the challenges of trailer suspension design is that these requirements often conflict with each other. Trade-offs are often required in order to meet these performance requirements over the suspension’s entire operating range. 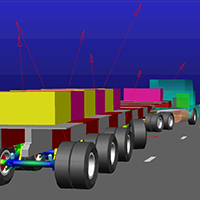 Simulation results make it possible to see every aspect of suspension behavior. Adams results match very closely with physical test measurements on numerous occasions comparing the tire loads, component forces, and suspension performance characteristics, such as ride height change. Simulation provides a much better understanding of how the proposed suspension design performs than can be obtained by physical testing. Loads determined by the simulation are used to design fatigue tests.